CLICK ON THE ARROW ABOVE TO SEE THE VIDEO! A fun video, and one of our educational counting songs, with catchy Caribbean music featuring five green monkey friends. An entertaining song-story by itself and for little ones interested in numbers, counting, addition or subtraction, this children’s counting song video is perfect because it visually shows what happens as you count down and then back up again! The five green monkeys get up to funny antics, and there’s lots of detail for children! This video is also available as a sing-along version with the lyrics on-screen to make it easy for adults to sing with and for children who are learning to, or can, read. 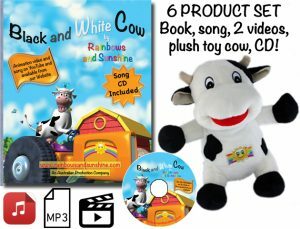 Both versions are available as a one-off purchase ($3.90 each) and this means your videos are free of advertisements plus your purchase goes directly to the Rainbows and Sunshine community book donation program to disadvantaged and sick children. The monkeys also feature as a funny “Oompah” band in the videos “Your Clothes” and are quite mischievous with their antics in this song-story. “Your Clothes” is about the funny places that clothes can go on you – something that kids universally laugh at! Does a hat really go on your arms or back? Humorous but you’ll notice that it’s got great educational value to little songsters also! The characters reappear consistently through our videos and we cover a huge selection of music genres…. we know our little fans appreciate quality, variety, and love our interesting live musical arrangements! 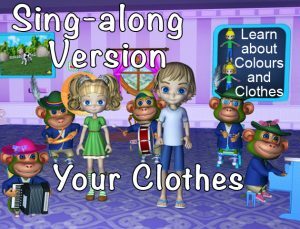 Below is a link to the singalong version of the video “Your Clothes” featuring the five green monkeys as an oompah band! “Your Clothes” video is also available as an original (i.e., non-singalong version). 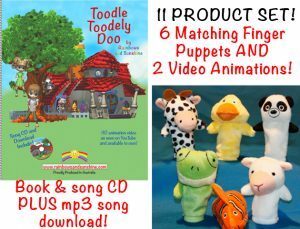 “Toodle Toodely Doo” 11 product set – Book, CD, mp3 song download, 4 matching 3D animated videos and 6 finger puppets for the story characters.